The effectiveness of a spam antivirus filter can vary considerably depending on the mechanisms used to identify spam and malware, and the order in which the mechanisms are applied. Even the functions of the antivirus software used in the filtering solution can make a difference between malware being identified as a threat or allowed into your organization´s network. These multiple factors can create headaches for organizations evaluating the effectiveness of spam filtering solutions. Spam filtering solutions often mention how good they are at “x”, but not necessarily “y” or “z”. Unless an organization is aware of every factor that contributes to an effective spam antivirus filter, the scenario exists whereby they may select a solution that creates more problems than it solves. Why do Spam Filtering Solutions have so many Mechanisms? A spam antivirus filter has multiple mechanisms to detect spam and malware because spammers and hackers use a variety of techniques to send malicious emails. No single tool or process can eliminate all spam and malware threats, so spam filtering solutions have a multilayered and multifaceted approach to filtering inbound emails in order to identify those which are malicious. Because of the number of processes used to filter inbound emails, the order in which the mechanisms are applied is important to prevent queues forming in a mail server. Front end tests such as comparisons against Realtime Blackhole Lists, Sender Policy Frameworks, and SMTP Controls quickly determine if an email is spam before remaining emails pass through a more intensive process that scans emails and attachments for viruses. The antivirus software used to scan email and attachments should have malicious URL blocking and phishing protection. Malicious URLs hidden within emails and their attachments – and phishing attacks – are now bigger threats to organizations´ online security than rootkits, adware and spyware. Without these features, a spam antivirus filter is not fully effective. The front end tests conducted by a spam antivirus filter are based upon “known” spammers and their IP addresses. Consequently, if spam is sent from a new source, it is not necessarily picked up by the front end tests. Leading spam filtering solutions have additional “second-wave” features to identify spam from previously unknown sources – “Bayesian Analysis” and “Greylisting”. Bayesian Analysis inspects the content of an email for words regularly associated with spam and attempts to disguise the words. For example, a spammer may send an email with the title “VVin α þrize” – two “Vs” representing the “W” of “Win”, the Greek letter “α” representing “a”, and the Icelandic symbol for “th” representing “P”. Some spam filtering solutions would not identify the title as a potential threat – passing the email through to its intended recipient. However, Bayesian Analysis would recognize the rather weak attempt to avoid spam detection and send the email for Greylisting. This process involves sending the email back to the sender´s server and asking for it to be resent. Because spammers´ servers are too busy sending out emails, the request to resend the email is declined. The “VVin α þrize” email is then classified as spam and quarantined. In this way, the two mechanisms prevent spam from previously unknown sources avoiding detection. It only takes one click of a link on a malicious email to allow malware into your network, and the cost of such an error can be colossal. In 2015, the Ponemon Institute produced “The Cost of Phishing & Value of Employee Training” report in which researchers calculated the average cost to an organization of removing malware infections and recovering data was $1.8 million. Even with highly-trained staff aware to the risks of spam emails, cost of an ineffective spam antivirus filter can be significant. It takes an average of four seconds to identify and delete a spam email. If yours is an organization employing 500 staff, and each were to receive five spam emails per day, an ineffective spam antivirus filter would cost your organization more than 109 days of lost productivity per year. By comparison, the cost of implementing an effective spam antivirus filter is typically less than $10.00 per employee per year. TitanHQ is an international company that has been developing email and web security solutions since 1999. 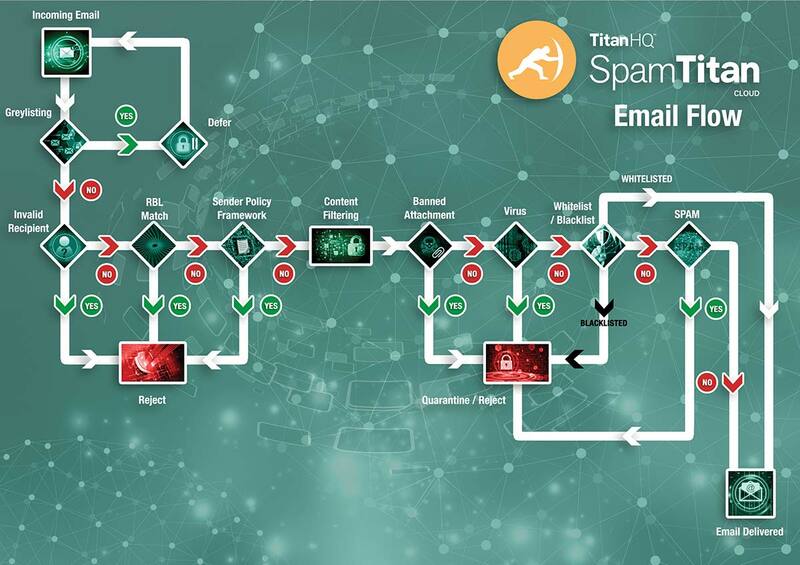 More than 5,000 customers use SpamTitan, our suite of spam filtering solutions to detect spam emails and prevent email-borne malware from infecting their networks. We offer two spam filtering solutions that are top-rated for “x” (spam detection), “y” (malware detection) and “z” (false positives) – “SpamTitan Gateway” and “SpamTitan Cloud”. SpamTitan Gateway is a software appliance that is installed between your organization´s firewall and its mail server. It is a robust spam antivirus filter that consistently has one of the best catch rates for Anti-Spam appliances from a host of market leaders. SpamTitan Gateway is an ideal solution for Managed Service Providers (MSPs). SpamTitan Cloud is a cloud-based spam antivirus filter that simply requires a minor change to your organization´s mail exchanger (MX) record to implement. With virtually no maintenance overhead and a choice of three hosting options, SpamTitan Cloud is one of the most versatile spam filtering solutions available. Both spam filtering solutions use the same mechanisms to block 99.97% of spam email and 100% of malware content and attachments with a low false positive rate of 0.03%. Both solutions include malicious URL blocking and phishing protection, and Bayesian Analysis and Greylisting. Both also have an easy-to-use administration console that includes customizable configuration settings, filtering options, monitoring features, and report options. One further advantage of SpamTitan Gateway and SpamTitan Cloud is that they scan outbound emails for content or attachments that may be interpreted as spam. The importance of outbound scanning is that it prevents your organization´s IP address from inadvertently being included on a Realtime Blackhole List – the consequence of which being that your organization´s emails would get identified as spam and blocked by your customers´ spam filtering solutions. Just as no two organizations are the same, no two spam filtering solutions are identical. Consequently we invite you to try SpamTitan for free for thirty days in your own environment in order to witness just how user-friendly, versatile and effective our spam antivirus filter is. Our offer consists of a fully-enabled spam antivirus filter with comprehensive customer and technical support. After the thirty-day trial period, there is no obligation on your organization to continue with the service – although we do provide a range of pricing plans to suit every budget. To take advantage of this invitation, simply call our team of sales engineers today. One of our friendly and experienced engineers will answer any questions you may have about spam filtering solutions and guide you through the installation and configuration of your SpamTitan spam antivirus filter.